Kristin Schell simply wanted to get to know her neighbors. When she moved to her neighborhood in Austin, Texas, several years ago, she saw garage doors go up and down, but never saw an actual neighbor. Craving a simple way to connect with others around her, she took a mistaken delivery as her talisman – a picnic table she ordered for her backyard was delivered to her front yard – under the magnolia tree right by the curb. She decided to paint it Nifty Turquoise, leave it in the front, and the #FrontYardPeople movement was born. Kristin never dreamt her table could spark a movement, but now there are Turquoise Tables all over the United States and around the world. Front Yard People are connecting at Kristin’s blog and on social media as she shares her stories and theirs with the world. 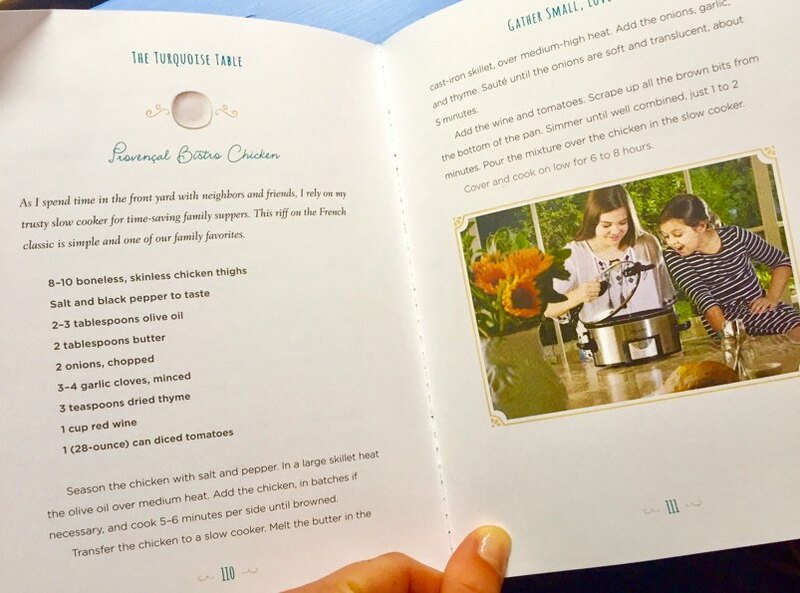 Kristin’s first book, The Turquoise Table: Finding Connection and Community in Your Own Front Yard, is a full-color hospitality guide filled with how-to ideas and recipes to help readers connect with neighbors…wherever they live. Kristin love affair with the table started during high school. After failing her French class, she was sent overseas on a language immersion program where she lived with a French family. Daily they would gather around their table for a lengthy and leisurely meal. And although she missed many of the conversation specifics, she could tell the connection around that table was rich and deep. Let's get to know Kristin - the Queen of Community ♕, through virtual ☕! ➳ Tell us about yourself! I'm Kristen Schell, and I am the author of The Turquoise Table! My husband Tony and I have been married for 20 years, we have four children, and we live in Austin! When I'm not sitting out front at the Turquoise Table, I'm most likely driving carpool in my minivan! I’m on a mission to love my neighbors. Four years ago I put a picnic table in my front yard, painted it turquoise, and began inviting neighbors, friends, and even strangers, to hang out and do life together at the Turquoise Table. A new concept of hospitality unfolded in my neighborhood, and before long the Turquoise Table led to a movement of Front Yard People—ordinary people who long to create community right where they live. Today, there are Turquoise Tables all across America from California to Maine. In all fifty states and in seven countries, Turquoise Tables have become a symbol of hospitality, a safe place to sit down and connect and have meaningful conversations. The book released in June and I have the privilege of traveling the country speaking to people who want to slow down from the craziness of life and grow deeper in their relationships! My morning devotion time is really the most important time of my day. In the middle of my kitchen, I have a prayer couch. My husband and I call it “my workouts!” I start most mornings on the couch with a cup of coffee, and work through scripture and my devotionals. I have a copy of Jesus Calling. I don't remember ever not having it! My children have it, too. In fact, we have several versions of Jesus Calling! ➳ How did the Turquoise Tables start? I am a table person! A natural-born gatherer. Bringing people together for real conversation and delicious food is so much more than a form of entertainment. For me, it’s a way of life. We live in the Digital Age—the most connected era in all of history. Yet, statistics show we are lonelier than ever. Social media has wonderful advantages, but the danger it presents is a false sense of connection. We are busier than ever and consume more data because it’s incessantly at our fingertips. But there is no iDevice that can ever replace eye contact. I’m passionate about unplugging and gathering at the table. The way that is started was, I thought "I'm going to invite some of my neighbor friends over for a planned coffee!" We met for coffee and they immediately loved the idea; and they loved it because it was it was something so simple and so doable. And all of our you know lives and I never anticipated but a couple of them said, “well, can we put picnic tables in our front yards too?” I was like, “sure!” I totally caught me off guard. So pretty early on people started putting turquoise tables in their front yards. 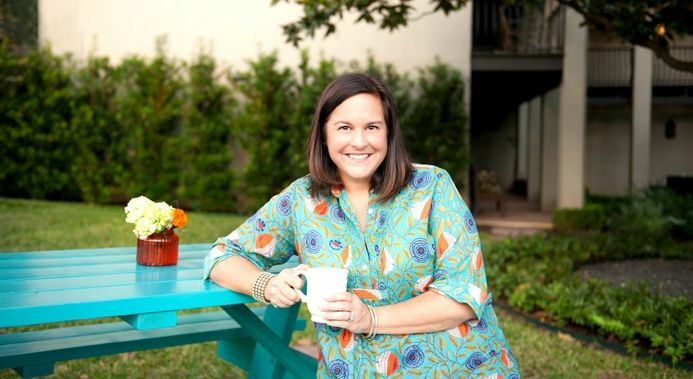 My role shifted; it became of “encourager.” I remember thinking, “really God, you want me to encourage people to put turquoise picnic tables in their front yards? Like for real?” And clearly He did. What was remarkable about what I was seeing unfolding at that point, is, yes; there was our turquoise table in our front yard. But then, as they started kind of branching out across the United States, there was this second layer of community; of people who were really trying in all honesty and earnestly to build a community in a simple way. I think that's the beauty of the story is that you know it's not about The Turquoise Table; The Turquoise Table has never been the hero of the story. God's people are the heroes of the story. But it gives us a tangible tool; a whimsical and delightfully creative fun way to invite people to come join us in life. So at this point now, tables are kind of popping up all over. I feel like I'm the one that is so blessed by the creativity, the passion, the stories, the vulnerability, the honesty of what other people are doing and how they're living as front yard people. It overwhelms me most days. ➳ How did you decide to write a book? My hope is that anyone who picks up the book, The Turquoise Table, comes away really encouraged, and not just encouraged in the heart, but encouraged to take action in very practical ways. One of the things that we talk about in the book, and I encourage people when I meet with them is, if you don't have a front yard, where are the natural places that people in your community tend to gather? I'm astounded by the creativity of how people are adapting the Turquoise Table Movement for their very specific needs. For example, we have our turquoise tables now on church patios, school atriums, hospital areas and farmers’ markets. Really, it's amazing to see how creative people can adapt to the concept. I've really tried to stay grounded in Scripture and in God's Word, which is how this whole movement really began. It was birthed out of my relationship, and my conversations, and my quiet time with Him. So I think it was just again, a testimony of God's goodness; His love, not only for me, but for everyone. The day before the book came out, I was reading Jesus Always and it says, “Do what you can and leave the rest to Me.” I just thought, that is what we all need to do; it's just do what you can with what you've been given, but let God do the rest. I often say when I'm encouraging other people to live as front yard people or to build community where they live, just open up your door, take three steps out, and let God do the rest! ➳ What advice would you give to your 20-something self? Yes, I'm Still Single in My 30's!